Cadmium was commonly used in VFDs in the past, but the current RoHS-compliant VFDs have eliminated this metal from their construction. VFDs can display seven-segment numerals, multi-segment alpha-numeric characters or can be made in a dot-matrix to display different alphanumeric characters and symbols. 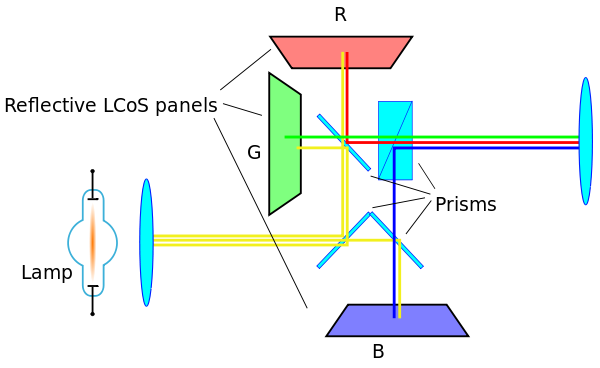 In practice, there is little limit to the shape of the image that can be displayed: it depends solely on the shape of phosphor on the anode(s). The first VFD was the single indication DM160 by Philips in 1959. The first multi-segment VFD was the 1962 Japanese single-digit, seven-segment device. The displays became common on calculators and other consumer electronics devices. In the late 1980s hundreds of millions of units were made yearly. Macro image of a VFD digit with 3 horizontal tungsten wires and control grid. The device consists of a hot cathode (filaments), anodes (phosphor) and grids encased in a glass envelope under a high vacuum condition. The cathode is made up of fine tungsten wires, coated by alkaline earth metal oxides, which emit electrons when heated by an electric current. These electrons are controlled and diffused by the grids, which are made up of thin metal. If electrons impinge on the phosphor-coated plates, they fluoresce, emitting light. Unlike the orange-glowing cathodes of traditional vacuum tubes, VFD cathodes are efficient emitters at much lower temperatures, and are therefore essentially invisible. The principle of operation is identical to that of a vacuum tube triode. Electrons can only reach (and "illuminate") a given plate element if both the grid and the plate are at a positive potential with respect to the cathode. This allows the displays to be organized as multiplexed displays where the multiple grids and plates form a matrix, minimizing the number of signal pins required. In the example of the VCR display shown to the right, the grids are arranged so that only one digit is illuminated at a time. All of the similar plates in all of the digits (for example, all of the lower-left plates in all of the digits) are connected in parallel. One by one, the microprocessor driving the display enables a digit by placing a positive voltage on that digit's grid and then placing a positive voltage on the appropriate plates. Electrons flow through that digit's grid and strike those plates that are at a positive potential. The microprocessor cycles through illuminating the digits in this way at a rate high enough to create the illusion of all digits glowing at once via persistence of vision. The extra indicators (in our example, "VCR", "Hi-Fi", "STEREO", "SAP", etc.) are arranged as if they were segments of an additional digit or two or extra segments of existing digits and are scanned using the same multiplexed strategy as the real digits. Some of these extra indicators may use a phosphor that emits a different color of light, for example, orange. The light emitted by most VFDs contains many colors and can often be filtered to enhance the color saturation providing a deep green or deep blue, depending on the whims of the product's designers. 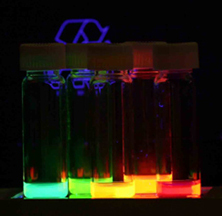 Phosphors used in VFDs are different from those in cathode-ray displays since they must emit acceptable brightness with only around 50 volts of electron energy, compared to several thousand volts in a CRT. Use Besides brightness, VFDs have the advantages of being rugged, inexpensive, and easily configured to display a wide variety of customized messages, and unlike LCDs, VFDs are not limited by the response time of rearranging liquid crystals and are thus able to function normally in cold, even sub-zero, temperatures, making them ideal for outdoor devices in cold climates. Early on, the main disadvantage of such displays was their use of significantly more power (0.2 watts) than a simple LCD. This was considered a significant drawback for battery-operated equipment like calculators, so VFDs ended up being used mainly in equipment powered by an AC supply or heavy-duty rechargeable batteries. A digital dashboard cluster in an American automobile. Vacuum Fluorescent Display Amplifiers For Primitive Radio'', ''eHam.net'' December 2008, retrieved 2010 Feb 8". Eham.net. Retrieved 2012-12-11. ^ "Des. Kostryca, ''A VFD Receiver (Triodes in Disguise)'', ''eHam.net'' January 2009, retrieved 2010 Feb 8". Eham.net. Retrieved 2012-12-11. ^ "Vox MV50 AC guitar amplifier". Retrieved 11 March 2018. 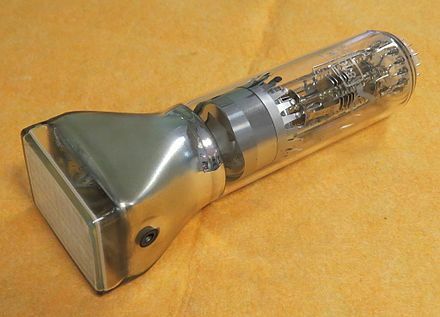 ^ "The Sangaku headphone amplifier". Retrieved 11 March 2018.